(Bloomberg) -- Donald Trump’s purge of U.S. immigration agencies is drawing backlash from Republicans on Capitol Hill while exposing an ideological divide within the president’s party and even inside the White House. 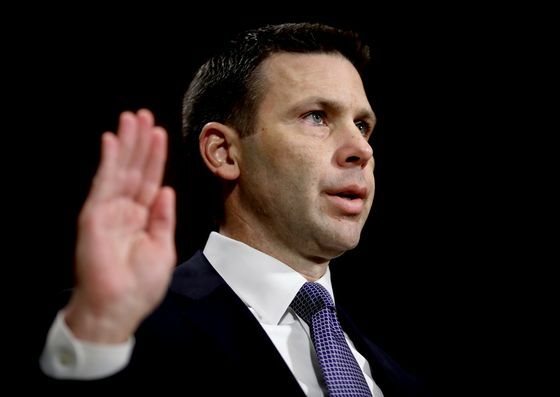 Hard-line aides to Trump, led by senior adviser Stephen Miller, believe that the elevation of Kevin McAleenan, who takes control of the Department of Homeland Security on Thursday, portends a soup-to-nuts overhaul of the administration’s immigration personnel and policy. They expect swift action to reduce illegal crossings of the border with Mexico, including new regulations to make it harder for migrants to claim asylum or work in the U.S. while their cases are adjudicated. But Senate Republicans are alarmed by the bloodletting within Homeland Security as well as the absence of any clear strategy to regain control of the border. Immigration is the president’s signature issue, and he has already declared it will be central in his re-election campaign next year. The personnel and policy turmoil muddies his case. Senator Ron Johnson, a Wisconsin Republican who chairs the Homeland Security Committee, said he was gathering signatures on a letter warning Trump not to remove the department’s general counsel, John Mitnick. Chuck Grassley, an Iowa Republican who chairs the Finance Committee and is one of the longest-tenured members of the Senate, called the White House to prevent the removal of two former aides believed to be in Miller’s sights. Miller, too, found himself under fire. His profile has been suddenly elevated by the drama at Homeland Security -- to his detriment, according to two Trump allies. One said that Trump likes Miller, but does not like the media coverage of the DHS resignations -- a narrative the president tried to change during a meeting with donors in San Antonio on Wednesday, which was unexpectedly opened to reporters traveling with Trump. There, before television cameras, the president and the donors, who weren’t identified, described San Antonio and its environs as stricken by crime committed by violent migrants and strewn with the bodies of those who die trying to enter the U.S.
San Antonio had the highest overall crime rate of the nation’s 15 largest cities in 2017, according to FBI data reported by the local Express-News, but crime is still half as common in the city as it was 30 years ago on a per capita basis. 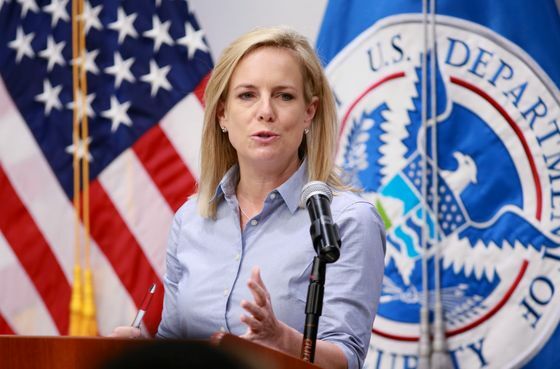 McAleenan replaces former Homeland Security Secretary Kirstjen Nielsen, who announced her resignation Sunday. She’s been followed out the door by the director of the Secret Service, Randolph Alles; the department’s acting deputy secretary, Claire Grady; and on Wednesday, the acting director of Immigration and Customs Enforcement, Ronald Vitiello. Trump yanked his nomination to lead ICE on Friday, setting off the personnel crisis at the department. Separately, a policy divide appeared to open among Republicans. Trump’s son-in-law and senior adviser Jared Kushner is developing an overhaul of the immigration system that is expected to increase legal immigration in an attempt to win bipartisan support. Trump’s chief of staff Mick Mulvaney, McAleenan and White House staffers met with a group of Democrats on Capitol Hill Wednesday evening to discuss the initiative. Following the meeting, Democratic Senator Richard Durbin of Illinois said he remains “skeptical” of reaching any deal with the Trump administration. But a trio of Senate Republicans who are close Trump allies -- Tom Cotton of Arkansas, David Perdue of Georgia and Josh Hawley of Missouri -- looked to undermine Kushner’s effort by reintroducing legislation, previously endorsed by Trump, that would effectively halve the number of immigrants allowed to enter the U.S. each year. A White House spokesman was noncommittal when asked if the president still supports it. “President Trump will always put American workers first -- and he is committed to an immigration strategy that puts an immediate end to the current crisis at our southern border, prevents illegal entry, moves to a merit-based system, and keeps the American people safe,” deputy press secretary Hogan Gidley said. Kushner was unable to strike a similar immigration deal during the 35-day government shutdown earlier this year, and it remains unclear how he’d convince Democrats to accept a plan that would also provide money for Trump’s border wall and changes to immigration law he’s advocated. It also isn’t clear whether Miller and Kushner are working together or at odds. The resignations at DHS came after hardliners in the White House determined that the agency’s bureaucracy was plagued by dysfunction, a consequence of an insufficient number of Trump loyalists in senior leadership positions, according to a senior administration official. The people holding the jobs instead, the official said, were regarded as hindrances to policies the White House believes will reduce migration from Central America. That includes more rigorous vetting of asylum claims, in which migrants must prove they have a “credible fear” of returning to their home countries, and restricting access to work permits for those whose asylum applications are pending before immigration judges. Under current rules, people seeking refugee protections can receive work permits five months after beginning their asylum cases -- a process that requires nearly three years to complete, on average. Critics of the existing policy say it creates an incentive for more migrants to head north. But regulatory changes are certain to draw legal challenges, and immigration advocates say that making work permits more difficult to obtain would greatly burden people who genuinely need asylum. The White House is also weighing whether to implement a new regulation, called “binary choice,” that would give migrant parents detained after crossing the border the choice of surrendering their children to relatives, other caregivers or government-contracted shelters, or be detained together in ICE facilities indefinitely. It’s an effort to circumvent the decades-old Flores settlement, which limits ICE detention of migrant children and has led to a practice Trump derides as “catch and release,” in which migrant families are generally given a court date and released from custody soon after their apprehensions. The “binary choice” policy, which a senior administration official said Wednesday is not ready to be implemented, would likely draw yet another court challenge. But even as Miller and others in the White House prepared more aggressive immigration policies, the president himself appeared wary of the political consequences. Trump has denied reports that he had debated reinstating last summer’s politically disastrous policy that led to separations of migrant children from their families, and has even disputed that a purge was underway at the Homeland Security department.